Star Wars Rogue Leader: Rogue Squadron II is one amazing looking game, especially for a GameCube game... between this & Resident Evil 4, they must be two of the best looking games for the system. 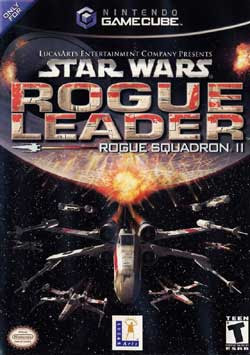 But...... Star Wars Rogue Leader: Rogue Squadron II is one of the best looking games-- that is broken beyond hope. The look & feel of the game is so faithful to the Star Wars movies that it's an amazing achievement. Unfortunately, it comes at the expense of playability. Let me put it plainly: space is really dark. TIE Fighters are really dark. So it's nearly impossible to see the enemies. You have a targeting computer that can highlight them as long as you constantly hold down the button. But the game *severely punishes you* for using the targeting computer at all. (game developer) Factor 5 is probably thinking, "Hey, Luke Skywalker never needed no targeting computer! And he managed to shoot down everything!" You know what? He managed to shoot down everything because it was IN THE F'N SCRIPT YOU DINGBATS! You can't just cripple gameplay to make it look "authentic". A game has to be playable, you know. And then there are obscure mission goals compounded by not being able to make anything out, so it's a lot of guesswork. The production values of this game are so good that it's a crying shame that it's so ridiculously unfun. Factor 5 is infamous for their botching of the game Lair, while I haven't played that one I can imagine why they were so panned. Lair looks good but apparently plays like crap. I guess Factor 5 should just disappear & not come back. But there's so much talent there with the production values that something should be done with at least some portion of the company talent pool. Factor 5 made a major mistake that a lot of companies make: it completely eludes them that a game needs to be playable by people who AREN'T part of its developer team, that a game needs to be playable by people who HAVEN'T played the game 8 hours a day for months during its coding & construction. There are only about 10 missions, so maybe they're trying to extend the gameplay by making it super hard so as not to let players breeze through it too quick. Such a beautiful looking game. What a waste.